The Single Supply Logic Level Converter combines a boost converter (TPS61200), adjustable voltage regulator (MIC5205), and logic level translator (TXB0104) into one board. It provides 5V to the high side of the TXB0104 and the low side is programmable to 3.3V, 2.5V and 1.8V. 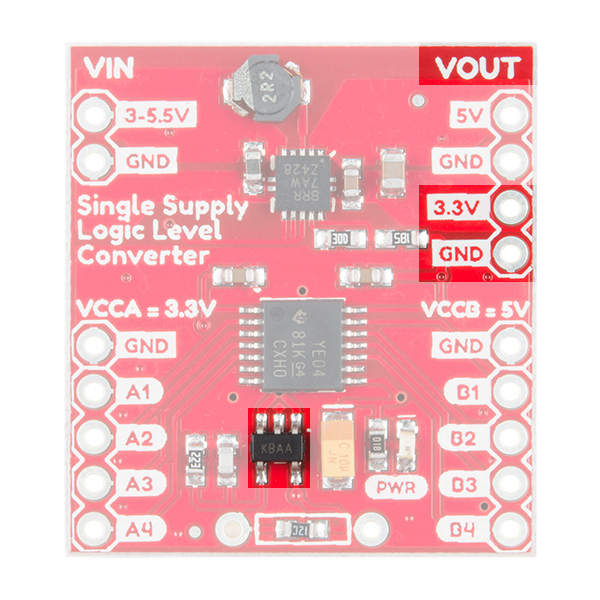 The default low side voltage is 3.3V. With this device you can use your 5V microcontroller with 3.3V sensors and vice versa without the need for a second power supply! Before we discuss hooking up the breakout, let’s go over some of the features of this board. The following table describes the pins that are broken out. 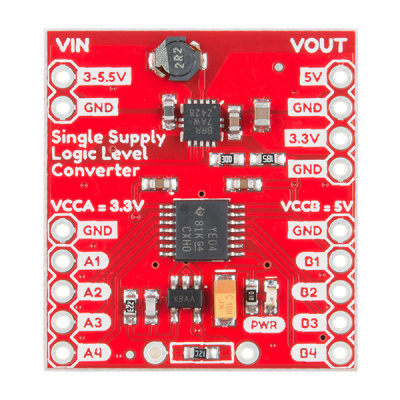 The Single Supply Logic Level Converter breaks out Texas Instrument&apos;s TXB0104 module. The TXB0104 is a 4-bit, noninverting, bi-directional voltage-level translator with automatic direction sensing. Each pin on this module is broken out for you to easily access ports A and B. Port A (A1-A4) is for low side TTL levels. This device's VCCA is set to 3.3V by default but can easily be programmable with a resistor to 2.5V and 1.8V. Port B (B1-B4) is for high side TTL levels. VCCB is hard wired to 5V. VCCA should not exceed VCCB. Depending on which voltage is chosen for VCCA the data rate may vary. To adjust the reference voltage for the low side, you will need an associated resistor value to adjust the MIC5205's output voltage. Below is a table of calculated resistor values that can be used. For more information, check out equation 4-7 on page 11 of the datasheet. Heads up! 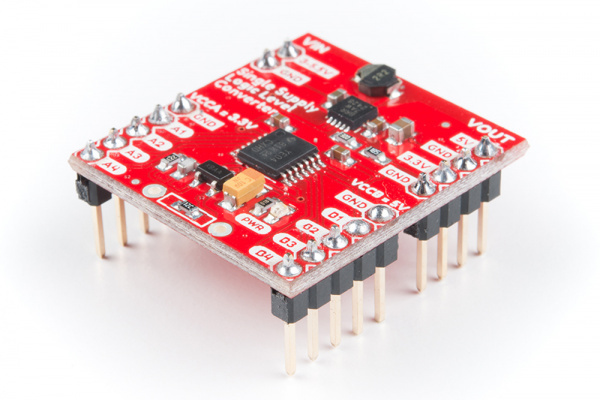 While the datasheet states that the TXB0104 can translate voltages on the low side for VCCA between "1.2V to 3.6V" and high side for VCCB between "1.65V to 5.5V", the board is only capable of translating a minimum of about 1.58V on the low side due to the adjustable voltage regulator on the board. Simply remove the default surface mount resistor with a blob of solder so that heat can be transferred to both terminals. Once heated, the surface mount resistor can be removed with tweezers or a gentle sweep of a soldering iron. Once removed, a resistor of your choice can be used to adjust the VCCA&apos;s reference voltage. Note: Depending on the resistor value, you may need to add some resistors in series to achieve the exact resistor value. If necessary, try using heat shrink, wires, and the snappable protoboard when adding the resistors in series. 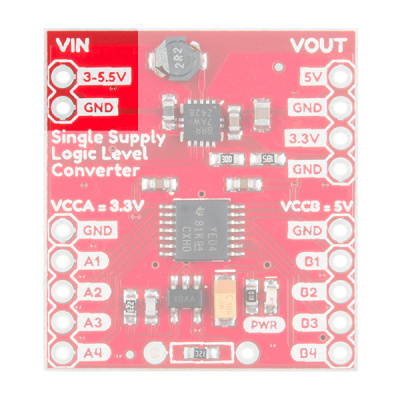 The TPS61200 buck/boost converter on the Single Supply Logic Level Converter takes an input between 3V - 5.5V (most likely from your microcontroller's VCC pin) and regulates it to 5V. This output is also connected to the high side on VCCB for reference. The output current of the TPS61200 depends on the input to output voltage ratio. The TPS61200 provides output currents up to 600 mA at 5V. The maximum average input current is limited to 1.5A. For more information, check out the datasheet. 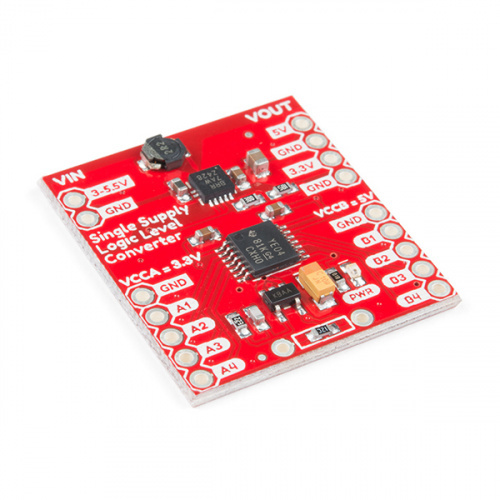 The regulated 5V is then further regulated to 3.3V, which is connected to the low side on VCCA for reference. There is an option to reprogram VCCA&apos;s voltage using an external PTH resistor as explained earlier. 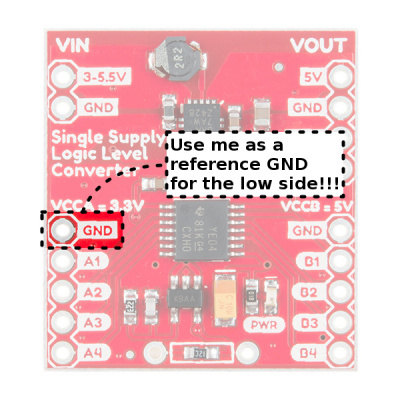 ⚡ Warning: The reference GND that you choose can affect the serial data being sent depending on how far your device is from the rest of the ground plane. You may notice some data not being sent correctly between your devices (like some gibberish or garbage data on a serial UART). 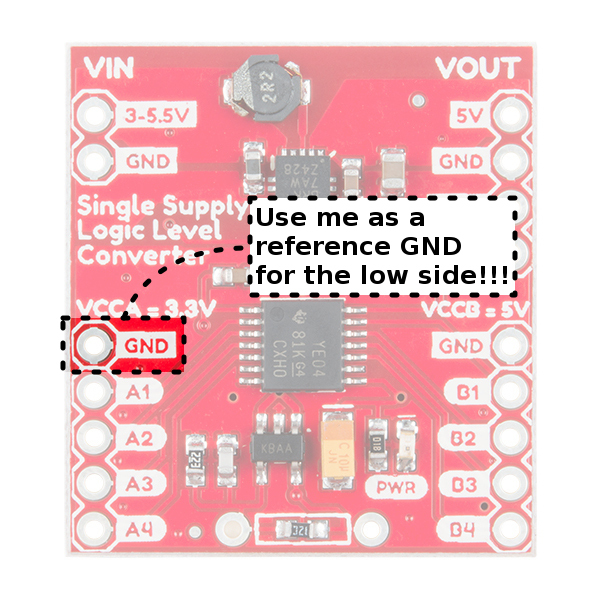 It is recommended to use the GND pin by the lower VCCA side above the A1-A4 pins when you are referencing ground on the low side. 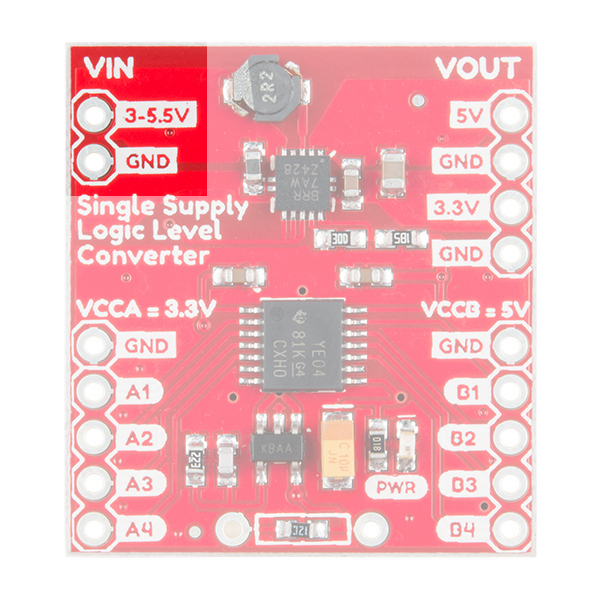 Not all logic level converters are the same! Compared to the lower cost bi-directional logic level converter with BSS138, the single supply logic level converter with TXB0104 is able to achieve higher data rates. The speed is dependent on the reference voltage that is used for the low side voltage on VCCA. This is indicated by the table below and was taken from the datasheet. For more information, check out page 8 of the datasheet. Heads up! 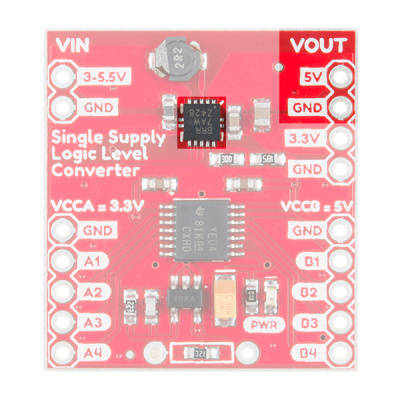 Remember, the single supply logic level converter can translate down to about 1.58V due to the voltage regulator attached to the VCCA&apos;s reference pin. You may get slightly above 40Mbps if you are referencing VCCA with about 1.58V. 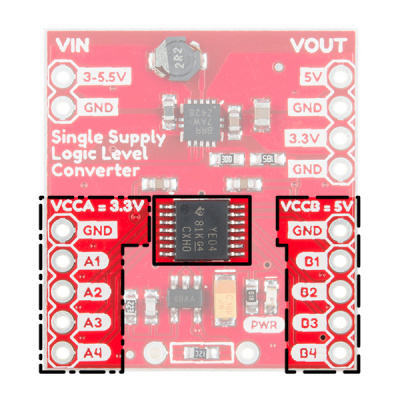 Grab some straight header pins, break the pins apart, and solder them to the single supply logic level converter. This would also be a good time to solder headers to the 3.3V/8MHz Arduino Pro Mini if you have not already done so! 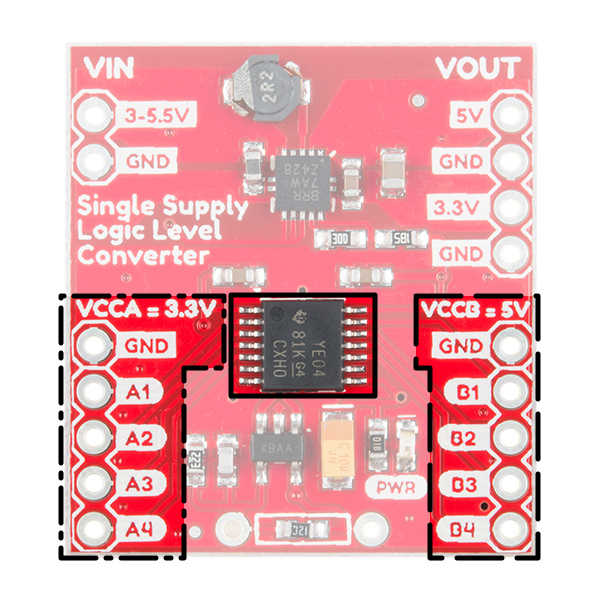 The single supply logic level converter can be used to shift data in either direction. 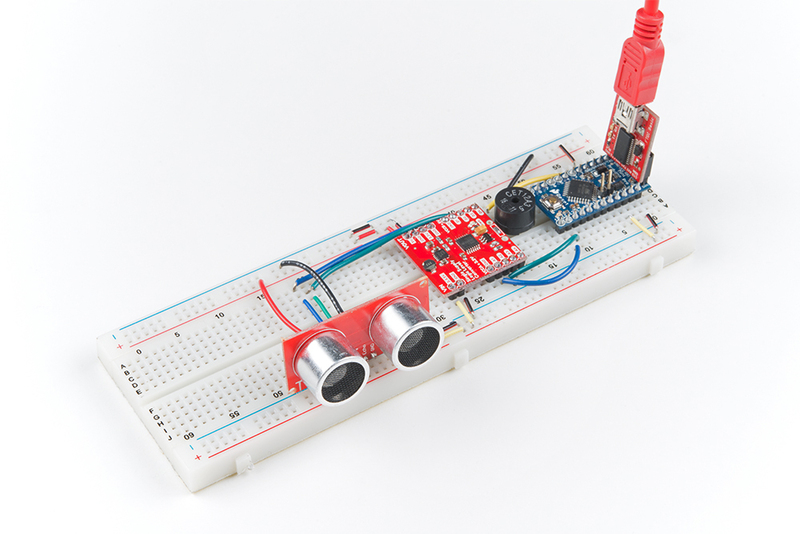 In this example, we are going to shift levels from a 3.3V Arduino microcontroller and a 5V sensor. Copy the code below and paste it into the Arduino IDE. 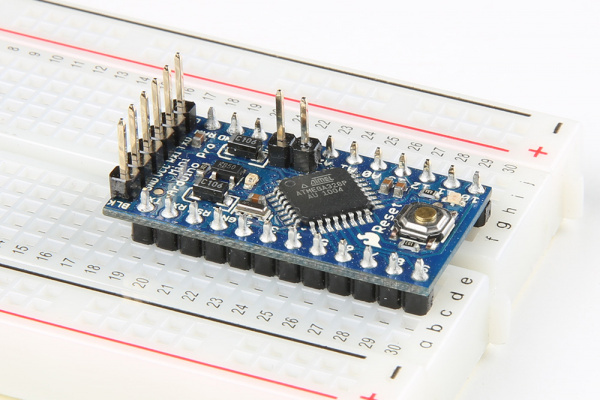 Since we are using an Arduino Pro Mini 3.3V/8MHz, make sure that you are selecting the correct board. Additionally, make sure to have the correct COM port selected when uploading. When ready, upload the example code! to distance. As objects get closer, the beep gets faster. // Calculate distance in centimeters. Heads up! We found that when using this code with an ATmega32U4 (like the Pro Micro 3.3V/8MHz), it requires the user to toggle the reset button after a power cycle. The initial current draw to the boost converter is enough to cause the Pro Micro brown out. After uploading, place your hand in front of the ultrasonic sensor. When your hand is within a certain range, the buzzer will begin beeping! As you move your hand toward the sensor, the buzzer will beep faster. Moving your hand away from the sensor will slow down the beeping until you are out of range. Troubleshooting Warning: HVAC systems in offices and schools have been known to interfere with the performance of the ultrasonic distance sensor. If you are experiencing sporadic behavior from your circuit, check your surroundings. If there are numerous air ducts in the room you are using, try moving to a different room that does not have ducts. The airflow from these ducts can interfere with the waves sent from the sensor, creating noise and resulting in bad readings.